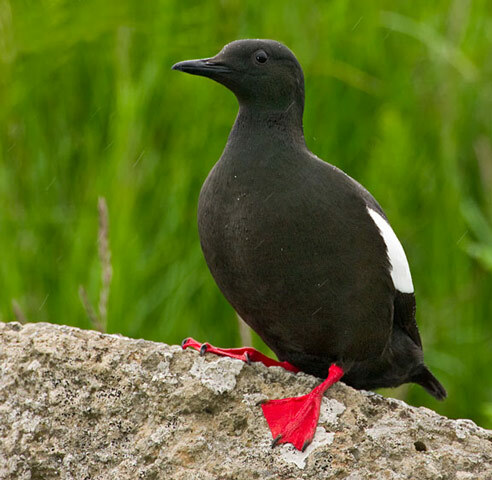 Black Guillemot: Breeds from Arctic Alaska and Canada south along Atlantic coast to Maine. Spends winters south to the Bering Sea and Long Island (rarely); also winters in northern Europe, Scandinavia, and Alaska. Preferred habitats include rocky coasts. 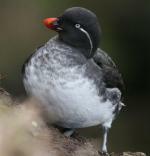 Black Guillemots’ are also called Sea Pigeons or Murres. 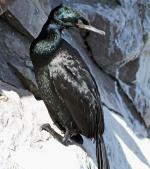 Oil spills and pollution along coasts are detrimental to this bird. They can dive to 165 feet deep. A group of guillemots are collectively known as a "bazaar" and a "loomery" of guillemots. The Black Guillemot is native to countries in North America as well as Europe. 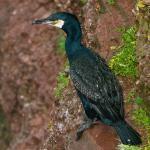 The range of this bird is estimated to be fairly large, covering up to 10 million square kilometers. It is thought that the population of the Black Guillemot is around 700,000 individual birds. At the current time, the population of this bird is not thought to be nearing possible population decline in the next several years. 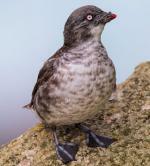 Currently, the Black Guillemot has a rating of Least Concern, downgraded from a prior Lower Risk rating.